Luscious lips have become something to envy among beauty-conscious women today. Many women believe that full and shapely lips are a symbol of sexiness, beauty, and youthfulness. While some patients would like to enhance their small, thin lips, others wish to erase the appearance of lines that have developed around the mouth. Lip augmentation can smooth and add fullness to the lips, improving their shape and counteracting aging to restore a more sensuous pout. Why Do Women Get Lip Augmentation? Another common reason women get lip augmentation is to help them appear younger and sexier. In general, most women want to achieve a certain “look” with their lips. While lip liner and lipstick offer temporary solutions, lip augmentation can provide plump, full lips with long-lasting results to help women feel confident about their appearance. Using the following lip augmentation techniques combined with his aesthetic eye, Dr. Diamond can give you beautiful lips that you can show off with confidence. Fat transfer utilizes your own body fat to enhance small or thin lips. It is also an ideal approach for those who want to take advantage of an opportunity to trim down stubborn fatty tissue in addition to improving their lips. Liposuction is performed to harvest fat from your abdomen, thighs, or another area of the body. The fat is then carefully processed to remove impurities. Once purified, the fat is injected into your lips to increase their size and fullness. Fat transfer may require secondary treatments due to the potential for fat resorption. FDA-approved hyaluronic acid fillers can be strategically injected into your lips to improve their fullness, curvature, shape, and size. With fillers, the treatment only takes a few minutes, and the results are immediately visible. 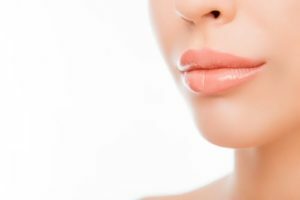 Choosing this option for lip augmentation will require regularly scheduled touch-up treatments because the results typically last an average of six months before the filler dissipates and the lips return to their natural state. A lip lift is a surgical procedure that can elevate and contour your lips. Tiny incisions are placed inside the lips or under the nose to allow Dr. Diamond to improve the contour and position of the upper lip. This technique will create fuller, larger, and shapelier lips. A lip lift procedure can take up to an hour, but results are long-lasting to permanent. Lip augmentation with implants can enhance the size and shape of your lips by inserting tiny silicone implants into the treatment area. This surgical procedure involves creating small incisions inside the corners of the mouth through which Dr. Diamond inserts implants directly into the lips, increasing their size and boosting their shape. Scars are concealed within the mouth, and the results are permanent. If you would like to learn more about our lip augmentation treatments, please call Dr. Diamond’s office at 310-859-9816 or set up a consultation with us online today!